One of the common assumptions people have about a Catholic elementary school education is that its curriculum may not be as extensive as what is being offered by its public school counterparts. Well, if the recently released New York State Standardized Testing Results are any indication, Saint Patrick’s is proving that assumption to be false. The latest report released earlier this year reflected test results for English Language Arts (ELA) and Math at the 4th Grade, 6th Grade, and 8th Grade levels. In every category, Saint Patrick’s School ranked higher than the composite scores for all other Catholic schools in the Diocese of Rockville Centre, as well as Huntington USFD. St. Patrick's School also outscored Cold Spring Harbor CSD on every category but one. See below for the test results. The values represent the percentage of students who met the benchmark set by New York State in achieving grade level expectations. 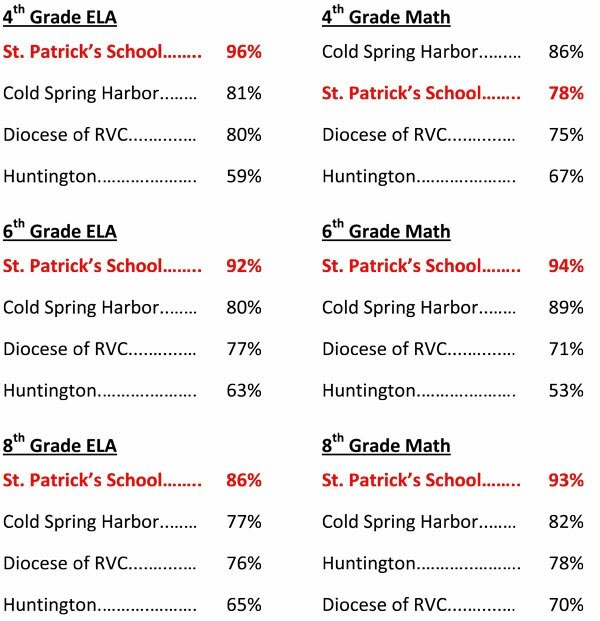 The chart below provides another view of the test results and how St. Patrick’s School did as compared to the diocesan schools and our surrounding school districts. So as you can see from these test scores, the notion of a Catholic elementary school education not preparing students for the next level of their educational experience is a total misconception. In fact, these results highlight St. Patrick’s School’s success, and are a tribute to the dedication and effort of the faculty and administration of our school. Congratulations!